Food Costs > How Much Does Vanilla Extract Cost? How Much Does Vanilla Extract Cost? Vanilla extract is a common ingredient that is found in various cooking and baking dishes. This extract comes from percolating vanilla beans, and in order to be FDA compliant, it must contain a minimum of 35% alcohol to 65% water mixture. Vanilla extract comes in many types that include bourbon vanilla, imitation, Mexican and Tahitiane, and the cost will vary depending on the the quantity, the type, brand and where you purchase it from. On average, an imitation vanilla extract commonly found in grocery stores can cost anywhere from $1 to $5 for an 8-ounce bottle. An immitation bottle, often referred to as vanilla flavor, won’t be made with alcohol; instead, propylene glycol or glycerine is used. Pure vanilla extract can cost anywhere from $2 to $4 per ounce. For example, at Walmart, McCormick’s pure vanilla extract retails for about $5 per one-ounce box. Costco’s Kirkland brand retails for about $12 to $16 per 16-ounces. The reason pure vanilla will be costlier than an imitation is due to the cultivation process and the price of vanilla, which tends to be on of the most labor-intensive crops in the world. For starters, it takes a vine about three years to produce the vanilla beans, and when the flower is ready to be pollinated, this must be done by hand. Then, after pollination, it will take another year for the bean to grow and will be picked by hand, cured and shipped out. Nielsen Massey, a popular vanilla extract manufacturer that gets its beans from Mexico, sells for about $15 per four ounces. Bulk purchases, often sold to restaurants, can cost $180 to $220 per gallon. The Kitchn.com tells us vanilla extract can range from as little as a few cents to more than a dollar per ounce for a pure grocery store brand. Vanilla extract will have a high, rich flavor that is very similar to vanilla. Like a wine, each brand will have its own flavors. Most vanilla extracts are going to be packaged in a glass or plastic bottle depending on the brand. Some bottles may include a measuring spoon to make measurements easier while baking. Most pure extracts will be made with chopped up vanilla beans, combined with ethyl alcohol, water and sometimes major brands, such as McCormick, have corn syrup. This extraction process can take upwards of 48 hours to complete and will be held in a holding tank until ready. A quality vanilla extract will be made with premium graded vanilla beans, a small amount of sugar and it will be properly aged. One tablespoon of vanilla extract, on average, equals about 38 calories, 0 grams of fat, 0 grams of cholesterol, 1 milligram of sodium, 19 miligrams of potassium and 1.6 grams of total carbohydrates and sugar. A kosher extract may cost 5% to 20% more. This is all going to depend on the brand, but you may find that most brands today are either kosher or organic. To ensure that it is pure, check the label to see exactly how it is processed. Companies should include information on the processing as well as indicate whether it is kosher or organic. A double-strength vanilla extract is going to be a vanilla extract, but it’s going to be double of what the base usually is. This is going to make it stronger, and if a recipe only calls for vanilla extract, only use half of the double-strength to make sure the taste isn’t too powerful. While vanilla extract is commonly intertwined with baking goods, consider adding this extract to beverages such as coffee, tea and even milk to add flavors. This extract can also be used in various dressings as well since it can greatly enhance the flavors. Vanilla extract has been known to help calm an upset stomach when feeling nauseous by simply adding a few drops to a glass of water. It can also be used to help treat wounds. It should be stored at room temperature in a dark environment such as a kitchen cupboard. Avoid storing in a freezer or refrigerator as this can often make the extract appear cloudy. As long as it’s stored properly, it can be kept indefinitely. Vanillaqueen.com recommends avoiding purchasing vanilla extract with a Mexican label since 99 percent of the time, it won’t be pure, even though it says it is. The problem is the mast majority will smell good; however, it won’t contain alcohol, creating a pure vanilla scent. As of 2017, there has been a vanilla shortage in Madagascar, the provider of close to 85 percent of the world’s vanilla. Due to this, the prices of raw beans have soared from $25 in 2011 to more than $400 today. 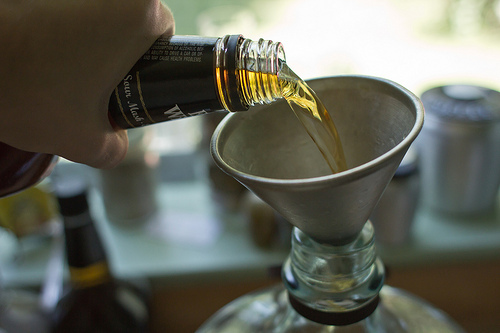 Substitutes for vanilla extract include maple syrup, almond extract, vanilla essence, vanilla powder, vanilla-flavored milk, vanilla-flavored liquer or a homemade vanilla syrup. How much vanilla extract equals a vanilla bean? One teaspoon will be equal to about two inches of a vanilla bean. Store brands will contain the same ingredients as the popular name brands and will cost up to 60 percent less. Walmart’s Great Value brand, for example, is 50 percent cheaper than a name brand vanilla extract. Reviews are everything online. Check out various cooking sites to see what products and brands other cooks recommend. Imitation extract may be cheap, but you may get exactly what you pay for. While higher end brands may cost more, the flavor may be more than worth it. Most cooks and bakers say that the flavor of the real vanilla is well worth the cost. Pure vanilla extract can commonly be found at the local dollar stores.